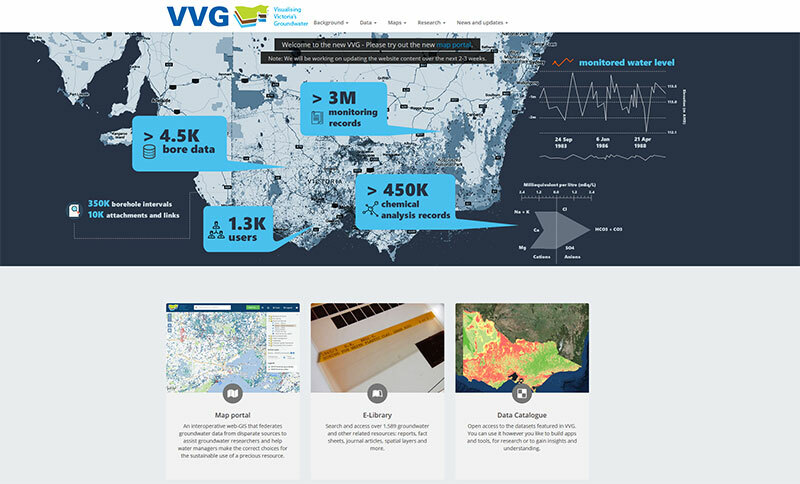 An updated and modernised Visualising Victoria’s Groundwater (VVG) portal was recently launched at a meeting of the International Association of Hydrogeologists (Victorian Chapter) by CeRDI’s Associate Professor Peter Dahlhaus. VVG is an interoperative spatial information portal that federates groundwater data from disparate sources. It was first launched in July 2012 and provides access to groundwater data from disparate sources. Principal Research Fellow Associate Professor Peter Dahlhaus and the CeRDI team have worked extensively on developing the new portal, further expanding its usability and functionality. Significant upgrades include an online library of resources, a spatial map interface, and a data download catalogue. In commenting on the portal, Associate Professor Dahlhaus said: “The system we created is an ongoing experiment in data democracy. It helps provide the evidential basis for community debates around the groundwater impacts of energy resource developments, urbanisation and changing climates”. The portal won State and National iAwards in 2013 and has been increasingly used by the groundwater industry professionals, government agencies, researchers and the general public. Associate Professor Dahlhaus has expert knowledge of the groundwater and hydrogeological settings in southwest Victoria and has been influential in applying his scientific knowledge to direct policy on salinity and catchment management. This expertise has greatly informed the recent developments for VVG. His current research focuses on spatial data interoperability and visualisation to ensure that environmental data, information and knowledge is globally and publically available.